Football season is inching closer as NFL teams have started their off-season training activity (OTAs) programs — the first sign that football season is only a few months away. As many players claim they are, “in the best shape of their lives,” and feeling, “the best they have ever felt”, fans can’t help but get more excited for the upcoming season. “Reiding Between the Lines” is a series that I started early on in my sports journalism and draft scouting career. It had a brief break due to switching writing platforms and websites, but now it is back with a debut series for the 2017-2018 season. It is by far my favorite piece to write and it is scheduled to be released every two weeks, usually on Fridays. It includes a scouting report on college prospects that I have studied in the spring, a section called “looking through the scouting binoculars”, which are notes that I have noticed from teams beat writers from around the NFL, a Twitter mailbag section where I answer questions from my twitter followers (@JReidDraftScout). Every journal will end with a “six-pack of final thoughts”, which are just my thoughts about news that’s happening around the world or simple thoughts that I have. Today’s scouting report highlights a prospect that is in the early pole position to be my top overall prospect for the 2018 draft class. Texas left tackle Connor Williams has caught my eye early on in the scouting process and it is for good measures. He’s a stud, and that’s as simple as I can put it. Whether it’s offensive or defensive lineman, hand usage seems like a lost art among college prospects. It is very rare that you see a prospect as advanced with it as Williams. He consistently delivers a violent punch with his hands, latching onto defenders, and he has a great understanding of exactly where he needs to place them. Many times with college offensive lineman, they just shoot their hands without having a proper plan of attack. You rarely see that with Williams. He is very wise when engaging in blocks. A blockers mentality is something that they are born with. Either they have it or they don’t. It is not something that can be taught — meaning that some have the mentality to finish plays, while some others stop as soon as the whistle is blown. Some argue that finishing isn’t always the most important part of the play for a blocker, but it is always nice to see a blocker do it. It is just effort. Williams has the mindset that he wants to put every defender he encounters on the ground. In the example above, Williams easily climbs to the second level of the defense and de-cleats the linebacker. That isn’t the most impressive part of the play though, it is the finish afterwards. He jumps on top of the defender to ensure that the running back is able to get through his lane cleanly. The backside linebacker ends up making the tackle, but if the RB had a clear lane, Williams’ block would’ve created a clear path for the rusher. Injuries. It’s something that can make or break the status of a draft prospect. It is a factor that you have to worry about the least with Williams. Since stepping foot on campus in Austin, he has started as the Longhorns left tackle for 23 straight games. Not only has he started in every game he’s participated in, but he’s only given up one sack to go along with it. A phenomenal accomplishment considering that Williams is playing one of the most premier positions in football. Williams’ ceiling is extremely high as he’s entering what is expected to be his last season in a Texas uniform. A lot of times with offensive lineman that are eager to get their hands on defenders, they have problems of being over aggressive. This results in them at times completely missing their targets. The good aspect about this though is that it is correctable and just takes a bit more of patience. This is a common theme with Williams. He has a bad tendency of putting too much weight on one foot, resulting in defenders getting into his chest and knocking him backwards. In the example above, Williams (left tackle No. 55) puts too much pressure on his outside (left) foot and allowing the defender to shoot his hands inside. This allowed the rusher to collapse the pocket and clog the throwing lane of the quarterback. — My NFL comparison for the Texas blindside protector is Philadelphia Eagles tackle Lane Johnson. Both not only possess identical playing traits, but Johnson (6-foot-6, 310 pounds) and Williams (6-foot-5, 320) also have similar body types. The fourth overall pick of the 2013 NFL draft, when on the field, Johnson is one of the premier right tackles in the league, but he has also shown the ability to play left tackle as well. He seems to be the Eagles left tackle of the future once current left tackle Jason Peters decides to hang up his cleats. Both possess unreal athleticism, smooth pass sets and display nastiness in the run game, making their match for one another perfect. Williams potential is a bit higher due to his projection of being a franchise left tackle in 2018 and being a better overall athlete than Johnson. If Williams does turn out to be just as good of a player as Johnson though, then the investment a team makes in him would have been well worth it. An offensive lineman hasn’t been drafted No. 1 overall since the Kansas City Chiefs selected tackle Eric Fisher in 2013. If Williams plays as good as he has his previous two seasons, he has a chance to challenge that feat. — We are right in the heart OTAs and it is great to see all the rookies in their new uniforms an veterans back with their teammates. It is a breathe of fresh air for fans as a new season is on the horizon. New beginnings and hope for every team around the league as the new league year is in full swing. — Looking back on the first-round of the 2017 NFL draft, it was an eventful night. Starting off with a bang, as the Chicago Bears traded up one spot for quarterback Mitchell Trubisky. The first night of the draft has turned into a spectacle of suspense and entertainment. Making it into a one night event is one of the best decisions the NFL has made in quite some time. — He was the last signal caller selected during the first-round of the 2017 NFL draft, but the selection was my favorite of the entire first night. Former Clemson QB Deshaun Watson was selected No. 12 overall by the Houston Texans. 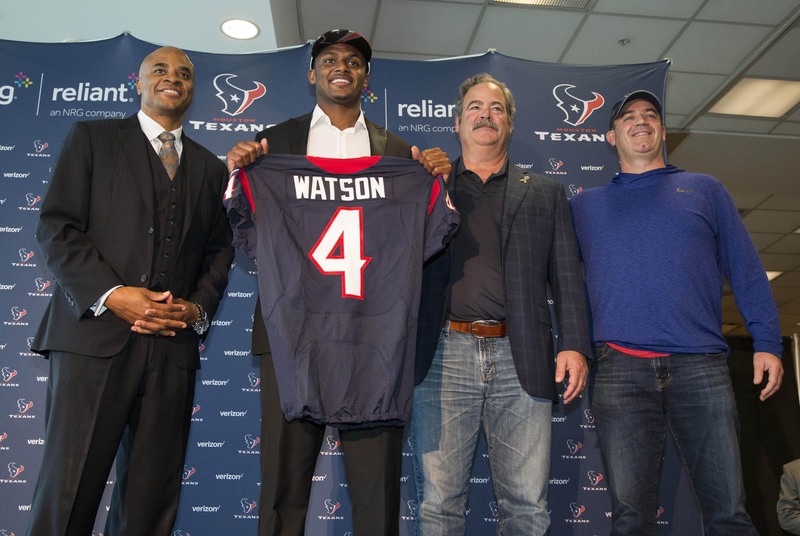 Constantly criticized throughout the draft process, Watson couldn’t have landed in a better spot. As evident during his time at Clemson, he is a thrower that must be surrounded by weapons and proper coaching. Watson is getting exactly that. Surrounded with good talent in receivers DeAndre Hopkins and Will Fuller to go along with running back Lamar Miller, if he is able to beat out Tom Savage at some point, Watson is set up for success upon his insertion into the lineup. — Kansas City Chiefs third-round selection Kareem Hunt is already receiving rave reviews out of OTAs. For most that studied the former Toledo rusher, it was hard not to fall in love with him. Showing balance, ball security, and impressive agility, Hunt had the makings of a solid mid-round prospect. In Andy Reid’s system and with the lack of a clear answer at the top of the RB depth chart, he has a chance to step in right away and be an immediate contributor. — One of the best and worst stories of the 2016 draft was former Notre Dame linebacker Jaylon Smith. Selected in the second-round by the Dallas Cowboys, Smith seeing the field last season was obviously unlikely. After suffering a serious knee injury in his final collegiate game against Ohio State, it was refreshing to see Smith get drafted. Pre-injury, Smith was viewed arguably as the top overall prospect of the entire 2016 draft class. It was devastating to see the talented linebacker suffer such a horrific injury. A year later, it is great to see Smith recovering and back out on the field playing football again. A podcast is something that I always wanted to start. Alongside my good friends Jayson Brown(@BrownJayson), Myles Gorham (@MylesGorham85) and the always entertaining Yinka Ayinde (@SaxyPrince), we have established the “Climbing the Pocket” podcast, where we discuss not only football, but current events around the world and world issues in general. Episode 10 was released this morning where we were joined by Matthew Coller, a Vikings reporter for 1500ESPN. We discussed various topics including Vikings OTA storylines, the NBA/NHL Finals and much more. August 31. It is a day that I will never forget. The day that Vikings QB Teddy Bridgewater suffered one of the most gruesome injuries ever suffered by an athlete. Though it was non-contact, he suffered a catastrophic knee injury. Fast forward to June 2, Bridgewater is already out on the field doing position drills during the teams OTAs. His recovery has been way further ahead of schedule that many could have imagined and we are all cheering for him to return to be able to play football again. If he is able to come back and have a successful NFL career, his story would be remarkable considering the obstacles and injury he faced. A store that once was the biggest electronics chain in the United States has now closed over 5,000 stores since 2014. Once featuring famous commercials that included former NBA superstar Shaquille O’Neal, the company finally filed for bankruptcy in 2017. It has since closed 1,000 stores since Memorial day weekend. Memories, whether they are on T.V. or personal, it is always weird to see companies just come and go as fast as they do. RadioShack seemed like a company that was here to stay forever, but that proved to be far from the case. Game 1 is officially in the books with the Golden State Warriors beating the Cleveland Cavaliers 113-91 to take a 1-0 lead in the best of seven series. The Cavaliers and Warriors series is the trilogy that all sports fans have been waiting for. The series is one that many expected despite the multitude of complaints from various fans and media outlets. The 2017 NBA playoffs have been one of the worst in recent memory due to the point differentials and most already knowing the expected outcome of the two teams who will battle at the end, but don’t say that the Cavs and Warriors are ruining the NBA. This rivalry is what the league needs, even though both are being considered super teams. This isn’t the first time the league has had a fierce rivalry in the finals. The Michael Jordan-led Chicago Bulls constantly battled Karl Malone, John Stockton and the Utah Jazz for consecutive years in 1997 and 1998. NBA rivalries are remembered forever and this current situation isn’t any different. One of my favorite TV series out right now is the hit series of the TV show called “Zoo”. It features the adventures of an African hunter and tells the tale of various obstacles that he and his three other friends face in their quest to save a plague that has infected wild animals into believing that they are stronger than humans and capable of taking over the world. It is an eye-popping series and steals your attention from the first episode. I’m looking forward to seeing season three and how it unfolds. It is a show that I highly recommend. A lot of times I get direct messages on Twitter from aspiring writers and people who ask how I’ve acquired so much football knowledge. The simple answer is to just tweet, write, watch football and read as much as you can. The only way to learn about something is to be around it as much as you can. Never believe that you already know it all about something because there is always something that you can learn or someone that can help you. I’ve developed an unbelievable amount of relationships with various people that I did not know before and gained valuable information from them all. Keep striving forward and always put forth the effort of the expected results that you want. For more NFL Draft news and analysis, follow Jordan Reid on Twitter @JReidDraftScout.